The best was most definitely saved for last. It's been hours since I watched Outlander Season 2 Episode 13, and I still can't find a place to start that could possibly do justice to the beautiful finale we all just witnessed. All I can do is react, share thoughts, hopefully inspire some discussion. Don't forget there is a thousand word recap under that link above. For now, let's pull up the nearest comfy chair and chat about the wonder that was "Dragonfly in Amber." Finally, we met Brianna, even though under rather tragic circumstances. What else though, other than a funeral, would have finally broken Claire's silence on all things Scotland? It's simply amazing that she managed to raise Brianna for 20 years, seeing Jamie in her face, eyes and behavior day after day after day, never saying a word. Not only that, but never having that burning desire to rush her beautiful daughter over to Scotland. How long has Frank been dead by the point we see them at Reverend Wakefield's wake, anyway? It's kind of hard to swallow that both versions of Tobias Menzies' Randall family line has been wiped out by this time, but it is what it is. I'll miss him. Claire had far more strength than I ever would have. Looking back, it's a good thing Frank burned her gown from the 1740s. One scotch too many and she may have found herself swirling in front of the mirror. Even once would have been one time too many, giving up what was one of the best kept secrets in Scottish history. 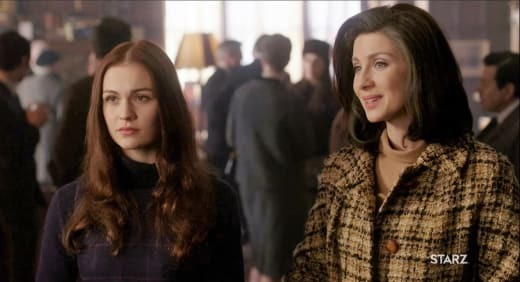 It's sometimes hard to fathom Caitrona Balfe as a modern woman, and still, she wasn't present day here, but good lord was she ever made for the 1960s. She was simply stunning in the hair and makeup of the era. There aren't many women you can put into a pair of glasses like those Claire wore on her drive to Lallybroch who would look incredible, but Balfe was up to the challenge. I think I fell more in love with her during this episode than ever. She's proven even more enigmatic. 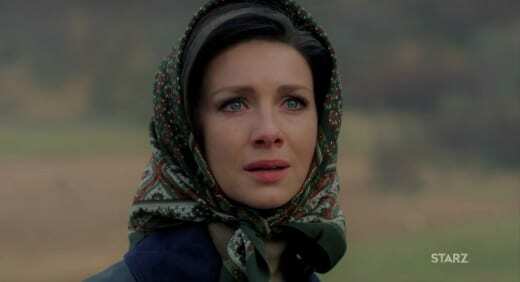 Keeping up the charade of her life, Claire traipsing off to Lallybroch and then the Culloden battle site was heartbreaking to watch, not only because of her past there, but because it was so close to her heart and sharing that with Brianna would have meant everything. It's as if her relationship with Brianna was everything and nothing at the very same time. But it gave time for Brianna to connect with Roger, and something tells me that connection is important. 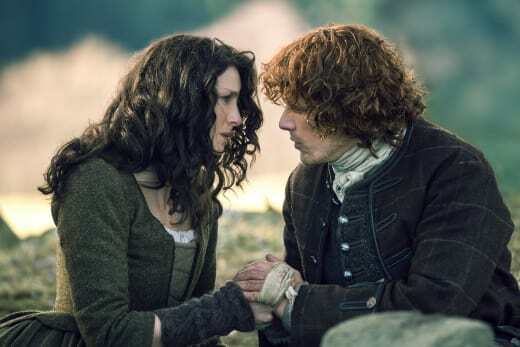 I never read beyond Dragonfly in Amber (and remember little of this anyway), but if those two are not destined to be together, I'll eat my hat! As soon as Roger said he was a MacKenzie, I figured he was part of Dougal's family line because we saw him die at Jamie's hands – with Claire's urging. (Who would have guessed that would be as painless to the viewers as it really was?) But I wasn't sold on Geillis straight away. But that two children seven generations down should find each other and get along as swimmingly as Roger and Brianna are at the onset? Come on. They have to get together, right? And it turns out no two history lovers are the same. It worked very well that Roger was ultimately more willing to believe in Claire's story than Brianna, especially given their distant past. Look, you told me that you could never get close to your mother, that she lived in another world. Well, maybe she's trying to show you that world. Even better, though, is that they're funny together. While he tried to convince her that his father would never have gone to all that trouble to write so much about a story he believed to be fabricated or an outright tale, he asked her to keep an open mind. Brianna decided they should keep an open bar tab, instead. At least she could see she was a Scot at heart, right? Roger even took the revelation his ancestors were a war chieftain and a witch in stride. Hell, he had to call the police on his own great x7ish grandmother after she burned her husband in front of Craigh na Dun and disappeared through a stone. Which he wasn't all that certain he was going to witness. Brianna: What if Gillian is as crazy as she is? What if she thinks you can actually travel through a stone into the past? Roger: Well then maybe we'll all get to watch her slam her head into a five ton slab of granite. Permalink: Well then maybe we'll all get to watch her slam her head into a five ton slab of granite. Gillian Edgars was a handful and a half long before she was fighting on behalf of the actual Jacobite cause. Right after Gillian her husband on fire, there wasn't a snowball's chance in hell she was going to stop to listen to three people trying to talk sense into her before plowing head first into a buzzing stone. If anything, She would have had the power to knock that bugger over on her way down the hill to try to save her tail in any way possible. It certainly was a great way to initiate the skeptical kids in the group. 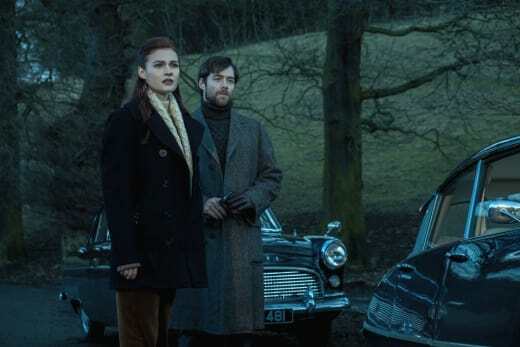 I can't imagine with all this finale setup we're not going to be seeing a lot more of Brianna and Roger in Outlander Season 3. 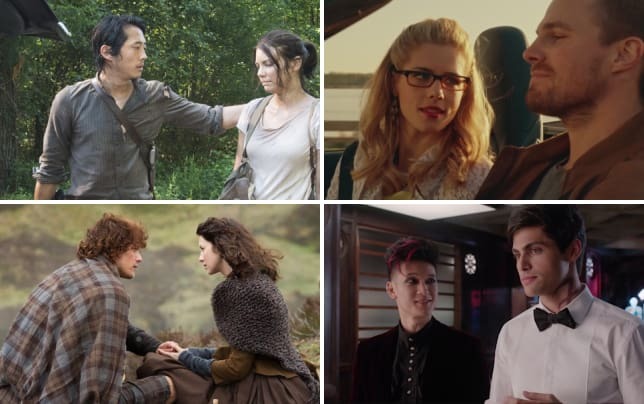 They seem a lot like Jamie and Claire, don't you think? And let's be real. Claire is minutes away from going back through the stones. Did you see her face light up when she heard the news? Jamie didn't die in the battle. What must she have been thinking? How could I have wasted so much time? Oh, BYE!! She would be so torn between Brianna and Jamie. But if she goes back, does she go back at the age she is now? Will she be 20 years older? And if she goes back, when would she arrive? If Geillis was already there when Claire got there the first time, does everyone get there the same day? Would Claire have to fall for young Jamie all over again? Not that there is anything wrong with a reverse May-September romance, but it's just more unlikely given the 1740s and all. With Brianna and Roger in the heady thickness of seeing all of that happen, would they just hop through the stones, as well? Does one plan for it, like Gillian did, or does one just pop over and hope for the best? I don't know if I should read a book or wait for the next season!! What do you readers suggest to those of us who are left questioning the world we just witnessed? And worry not. I'm not forgetting how much we saw of the love story between Jamie and Claire in this finale. Finally. Dougal first got into trouble for the terrible names he was using for Claire when calling her out as a traitor. It was almost as if he was asking to die. He had to know Jamie would never let those words escape his lips, but he continued using them. Then they signed the very document she found in the present on Lallybroch. And they FINALLY told Fergus they both loved him with all their hearts as their own son. With every passing phrase, it became more apparent we were nearing their moment of separation. Jamie really surprised Claire when he told her he knew she was pregnant because (like all men...haha) he had been keeping track of her menstrual cycle. Ladies, that's the man. When you find that one, keep him. That's the love of your life. Protecting their child then became more important than both of their lives, because it was the result of their life together. The scene at the stones could have been too rough and tumble, it was so quick. But instead, it was beautiful and thoughtful and full of longing. But when I stand before God, I'll have one thing to say to weigh before all the rest. Lord, ye gave me a rare woman and God! I loved her well. Permalink: Lord, ye gave me a rare woman and God! I loved her well. As the guns started firing, the urgency of the moment didn't force them to go any faster, but Jamie slowly walked Claire over to the stones, and crying, they touched it together...which brought us right back to Outlander Season 2 Episode 1. It was really quite brilliantly set up for the season's premiere and finale to bookend the events. 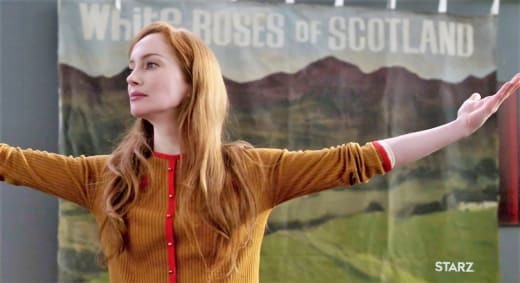 Brianna was an unknown under the loving, stroking hands of three adults before she was born in the premiere, and she was an adult who learned about her past in what seemed like the blink of an eye 20 years later in the finale. Her life seems to center on the stones more than any other's. Of course Brianna met Roger. They are probably as fated to be together as any others. The stones had to have brought them together. Didn't the stones have something to do with the Reverend's heart attack, too, so that Claire would be there at just the right time to see Gillian before she was off to become Geillis? What did you think of the finale? Are you as full of...everything...as I am at this moment? Talk about it in the comments!! Don't forget, you can watch Outlander online any time right here via TV Fanatic. Don't lose the loving feeling!! Roger: Can I ask you something? How do you do it? Finally say goodbye to that one person you loved most in all the world? Claire: Truth is, I've never been very good at saying goodbye. But that's the hell of it, isn't it? Whether you want to say goodbye or not, they're gone and you have to go on living without them. Because that's what they would want. Mrs. Graham had warned me not to chase ghosts, and so I hadn't. But now that I was here, the ghosts were starting to chase me.